Lotus Heart supported for health check up of 40 elderly people (mostly female) at Lotus Heart Office. Lotus Heart supported for surgery of five nuns with fibroid uterus and menorrhagia with anemia. A 52 yrs nun from Sherpa Gumbha, Kathmandu presented with the complaint of generalized weakness and fatigue with history of menorrhagia. She was diagnosed as fibroid uterus with menorrhagia and severe anaemia. She had a history of blood transfusion with the same problem five years back however due to ignorance and poor financial conditions, she never sought health check up until she was seriously ill and reached the hospital where she met Dr. Kunsang Dolma Sherpa, president of Lotus Heart. Dr. Sherpa being the gynecologist and closely involved in providing health services to nuns and monks diagnosed her with fibroid uterus requiring total abdominal hysterectomy. Dr.Sherpa says " Fibroid uterus is very common among nuns presenting with menorrhagia leading to anaemia". 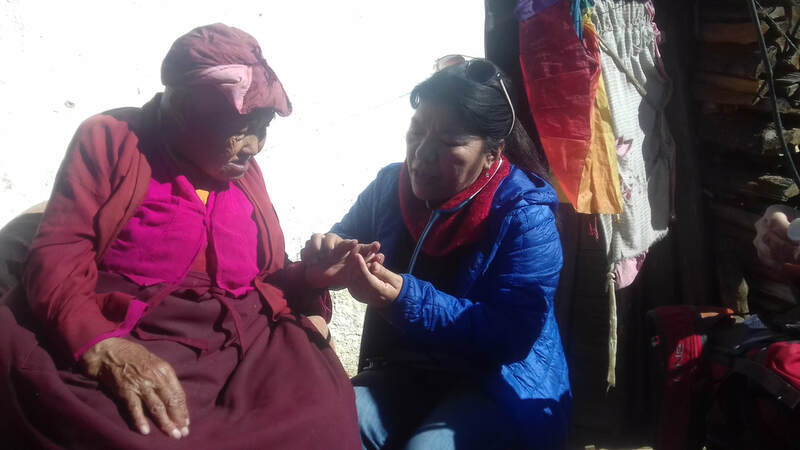 Due to the financial constraints, the nun was reluctant to for the surgery, but Dr. Sherpa counseled her and her family members about the consequences and committed 50% cost contribution from Lotus Heart. The patient party was happy for the support and agreed for surgery. Nun and her family members were very happy for the support and thanked Lotus Heart. She added that "she had seen many nuns with similar problems who do not reach the health system due to various barriers like language, financial, transportation and ignorance." Women are key managers of natural resources and powerful agents of change. Women Empowerment itself elaborates that Social Rights , Political Rights , Economic stability , judicial strength and all other rights should be also equal to women. Women should know there fundamental and social rights which they get once they born.